The average victim of elder financial abuse loses upwards of $120,000. Recognizing financial abuse as the most common type of elder abuse, and accepting responsibility as a first-line defense, Maryland nonprofit financial counseling agency, CCCSMD is leading a statewide campaign in partnership with Maryland Comptroller Peter Franchot and Maryland Attorney General Brian Frosh to “Protect Older Americans from Financial Exploitation” — declared PROTECT Week. 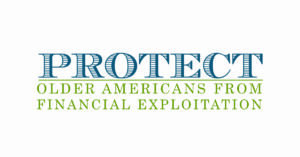 During PROTECT Week, January 8-12, 2018, Marylanders will have an opportunity to learn about the many forms of abuse, neglect and financial exploitation of older adults via the resources of more than a dozen local and national partners including Maryland Office of the Comptroller, the Maryland Office of the Attorney General, CCCSMD, EverSafe, AARP Maryland and AARP Fraud Watch Network, Maryland Department of Aging, Maryland Department of Veterans Affairs, Maryland Volunteer Lawyers Service, Maryland Consumer Rights Coalition, Wells Fargo, the Montgomery County Office of Consumer Protection, and The CASH Campaign of Maryland. A presentation on safeguarding financial well-being and preventing financial harm and elder financial abuse with special guests Co-Founder and General Counsel of EverSafe Elizabeth Loewy; Robert E. Frey from the Office of the Attorney General Consumer Protection Division; and Wells Fargo. It’s time to protect yourself from predators. Join us for Protect Week.